Under the streets of London there's a world most people could never even dream of. A city of monsters and saints, murderers and angels, and pale girls in black velvet. There's a girl named Door, an Angel called Islington, an Earl who holds Court on the carriage of a Tube train, a Beast in a labyrinth, and dangers and delights beyond imagining...And Richard, who only wants to go home, is to find a strange destiny waiting for him below the streets of his native city. This stunningly original and brilliant first novel from storytelling genius Neil Gaiman has now been variously adapted into a graphic novel, a television series and an acclaimed six-part radio dramatisation on BBC Radio 4 and BBC Radio 4 Extra. 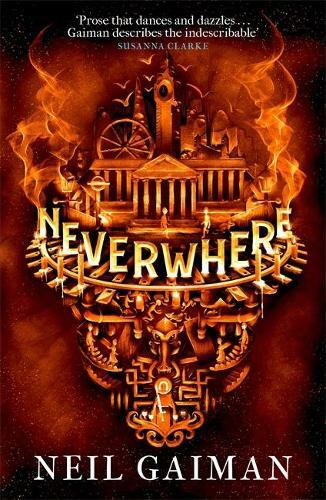 Fans of the story can delve further into the world of Neverwhere with the novella How the Marquis Got His Coat Back. Includes extra material exclusive to this Headline Review edition. A master of strange and wonderful worlds, Neil Gaiman began his career first as a journalist and biographer but his writing career really began with ground-breaking comic series Sandman, which received a number of awards, including being the first comic to win a World Fantasy Award. An undoubted cult figure in the arena of fantasy fiction, his output includes prose, poetry, film, journalism, comics, song lyrics, and drama but he is best known for his bestselling novels, including Neverwhere, American Gods, Stardust and his books for children including The Graveyard Book, Coraline and The Ocean at the End of the Lane.